Atkinson, NH – January 23, 2018 – Semiconductor Circuits, Inc. introduces the new “Cool Power Technologies” Compact Chassis Mount DC-DC converter series. 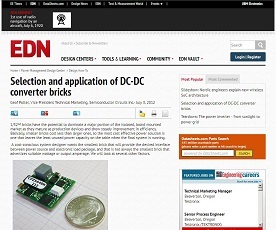 Industrial applications can present challenges when there is a need to use board mount power (BMP) DC/DC converters. Not all systems have printed circuit boards (PCB) available to mount a thru-hole module. This does not mean however that these applications cannot take advantage of the latest technologies in BMP designs. 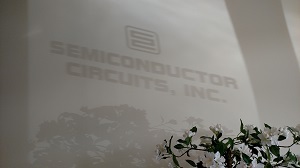 Semiconductor Circuits, Inc. a division of Cool Power Technologies has been creating unique customer specific application solutions for over fifty years. Our latest innovation addresses this shortcoming in a simple and elegant fashion. Available with output power from 10 to 100 watts, the new CPQ series offers all of the advantages of our popular CPT family of 16th bricks in a low profile 2″ x 2″ x 0.6″ (1.18″ height at terminal block) chassis mount package while still offering the flexibility of either a 2:1 or ultra-wide 4:1 input voltage range. Input and output connections utilize a convenient push-spring terminal strip or optional screw-type terminals. The two middle terminals are be specified as Output Trim and an Enable option (positive or negative enable.) Four (4) optional threaded inserts can be provided for mounting. The CPQ product briefs are available here & sample quantities can be ordered directly from stock via the website. Please contact sales@dcdc.com or call 1-888-GET-DCDC (1-888-438-3232) toll free for OEM pricing and availability. Other output voltages are available upon request. We also welcome quick-turn modifications and custom configurations to meet our customer’s particular requirements. 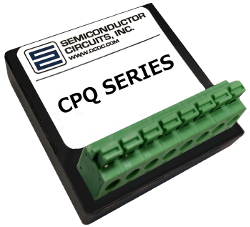 Semiconductor Circuits, Inc. has been designing and manufacturing AC/DC & DC-DC modules for over 50 years (founded in 1966.) Module applications include: industrial, test, telecom/communications, networking, vehicle, data-processing, railway, military, medical and aerospace. Please visit our website at www.dcdc.com for more information.